Nothing like drawing things out. Yep, I'm finally announcing the winner of the Thermos Water Bottle Giveaway!! Laurel, send your mailing info to me at ihaverun@hotmail.com, and I'll make sure you get your bottle! 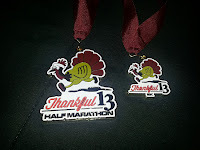 I ran a 5K Turkey Trot on Thanksgiving. I set a new PR with a 22:55 finish. My girls ran the kids 1/2 mile loop on Thanksgiving. The Princess tore it up; however my little Bean wanted me to carry her most of the time and told me about halfway that she doesn't like races. She was pretty excited about the medal though, so that may have softened her a little for future races. 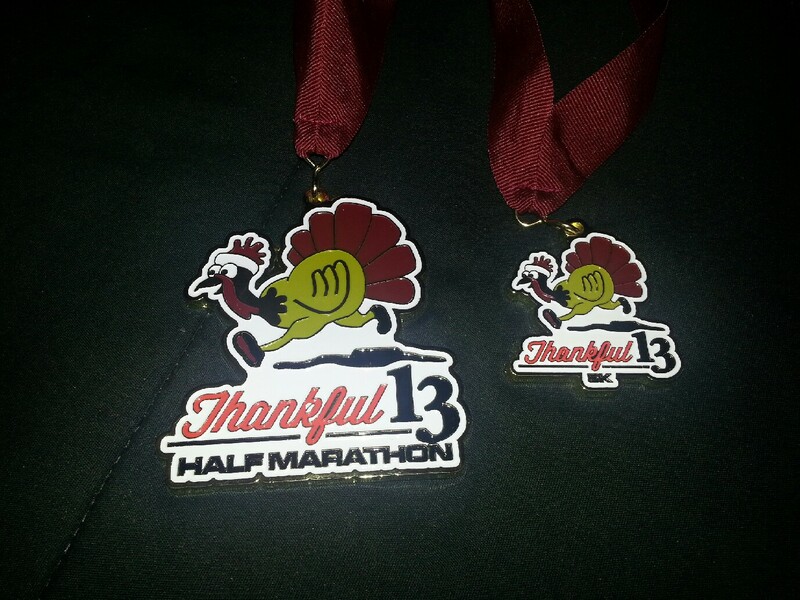 The kids got the same medal as the runners who finished the half marathon. It is more than twice as big as mine. Can't say that I blame her for being so excited about it. Friday I met some awesome friends/blogging runners at Yogurtland (of course). Jen, Ash, Pam (Ash's darling, crazy fast running mom), Rachelle and Janae, who was here from California with her darling little Brooke, were all there. It was so fun to see them, get caught up on each other's lives and, of course, talk about all things running. Saturday I bought some new running clothes. Always worth mentioning. If you follow me on Instagram or Twitter, you may have seen my cute new blue shirt this morning (I got one in pink too)! On the way home from shopping, I changed into my running clothes and had the fam drop me off. I wasn't sure how far from home I was; I was guessing about 7 miles. About 1.5 miles in, the hubs called to let me know it was 10.75 miles to our house from where he dropped me off. I was actually excited to have a reason to add a little extra. This morning I got in a quick 5.5 miles. No better way to start a Monday or to finish off a long weekend of lots of pie! And last but not least, I'll be hosting another Runnerd Photo-a-Day Challenge starting on December 1st. I'll post the list on Wednesday, so keep an eye out. And there will be prizes again. The rules will be a little different, but the biggest difference between this one and the last challenge will be extra entries for photos that combine running and Christmas!